MDC Celebrates 55th Birthday with a Very Special Anniversary Year! The Association was founded in 1962 by a small group of attorneys to exchange ideas on common defense problems and keep abreast of changes in the law. At the first annual meeting the following officers were elected: President—John H. Mudd; Vice-President—M. King Hill, Jr.; Secretary—Edward J. Thompson; and Treasurer—Raymond A. Richards. Four standing committees were created: Program and Education; Legislation; Public Relations; and Membership. In our inaugural year the organization had approximately 30 members, and most were associated with the law firms Whiteford, Taylor; Smith, Somerville & Case; Semmes, Bowen and Semmes; Ober, Grimes; O’Doherty, Gallagher and Nead; Rollins, Smalkin; and Lord, Whip. The membership fee was $10. In 1983 the Association published the inaugural issue of Defense Line and formed an Appellate Practice Committee. In 1997, the Maryland Association of Defense Trial Counsel officially changed its name to Maryland Defense Counsel, Inc.
MDC has had a long commitment to projects and programs serving the bench and bar. For example, we worked with the judiciary in ASTAR—the Advanced Science and Technology Adjudication Resources project and hosted a symposium entitled Great Strides, Great Struggles: The Continuing Case for Diversity 70 Years after Murray 2008. In recent years, the Maryland State Bar Association has twice awarded MDC the Best Service to the Bar Award for our annual Trial Academy, a full day devoted to trials and the skills needed to win them. 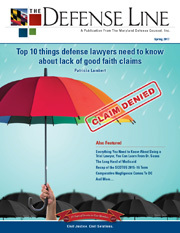 A full history is available on the website at www.mddefensecounsel.org/history.html. In this Anniversary Year, a video with interviews of MDC Past Presidents and more is in the works, thanks to the generous support of MDC law firms and DRI. 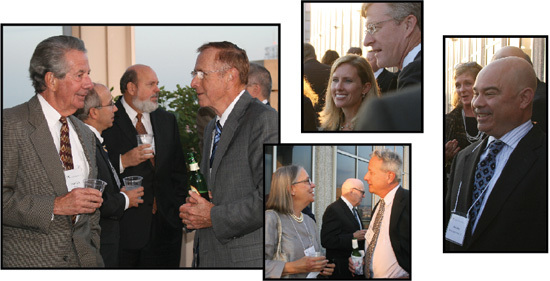 Throughout the year, we will be recognizing the people who have made the organization flourish, at the Trial Academy on April 24, the ever popular Crab Feast on June 7 and the Past Presidents Reception in the Fall. For a full list of Past Presidents go to www.mddefensecounsel.org/pastpres_names.html. The many law firms that have contributed by becoming Anniversary Sponsors are listed at www.mddefensecounsel.org/index.html. Contact Kathleen Shemer at kshemer@mddefensecounsel.org for more information as it is not too late to sponsor. Please join us in supporting Maryland Defense Counsel.